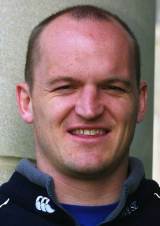 Gregor Townsend made his international debut for Scotland against England during the 1993 Five Nations. A mercurial, and often frustrating, talent at fly-half Townsend went on to win a then record 82 caps for Scotland whilst enjoying a varied and successful club career. He began his club days with Gala RFC before joining Northampton Saints in 1995, subsequently being selected for the 1997 British and Irish Lions tour to South Africa, on which he won Test caps at fly-half while Neil Jenkins of Wales occupied the fullback shirt. Townsend left the Saints in 1998, joining French side Brive. Townsend was part of the Scotland side that won the last Five Nations championship in 1999 and the following year made the move from Brive to Castres. Post-Castres, Townsend returned to Scotland with the Border Reivers in 2002 before moving to South Africa to play for Natal Sharks in the 2004 Super 12. After his southern hemisphere odyssey, Townsend returned to the French top-flight with Montpellier before ending his career with Borders in 2006. Post-retirement Townsend has enjoyed stints coaching with Borders, Edinburgh and Scotland A and was appointed as Scotland backs coach for the 2009 Six Nations in January 2009. He was later retained as Scotland's attack coach when Andy Robinson took control of the national side in the summer of 2009, opting to leave three years later in order to succeed Sean Lineen at Glasgow Warriors.